Add melted butter/Marge, water and milk and incorporate into a dough. Knead dough for 10 mins. Place dough in a lightly floured surface, cover with greased cling wrap and leave to rise for 15 mins. Knock down the dough and divide into 12 equal balls. Shape each ball in a long log shape by rubbing between oiled hands. Leave to rise until double in size. Deep dry in hot oil until golden brown on med heat. Once cooled, slit the doughnut down the middle, spread with a line of jam and pipe whipped cream inside, a cherry and sprinkle with icing sugar. I made this dounuts and they came out just divine. I would like to post a picture of the donuts, I cannot seam to do that from my black berry. Are you a member of our FB group? 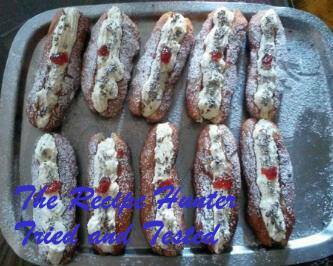 If not join the group and then search the recipe and add your picture there then I will upload to the blog. I will look into posting direct to blog with my IT this week. Sorry for the inconvenience. Glad you made it and its yummy.